Where and when should Graffiti be used in a design? 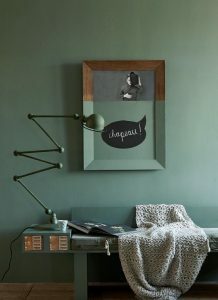 As modern Grafitti is usually applied using spray paints and marker pens, it tends to work best on single large feature walls where there is optimum space for large and expressive flourishes of paint! Large Scale Art and Public Art used in this way can create destination venues, as guests and visitors will travel to see what is on offer. Murals can also embed a site in its location by celebrating elements of the surrounding area and the target audience in the design. At this site we used Graffiti to maximum effect to detract from the brick facade which looked like an old apartment block. 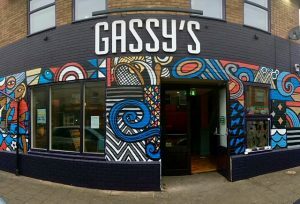 A bold and eye-catching design was needed to indicate the site was a pub and to give the building, and its use, a new and unique personality. 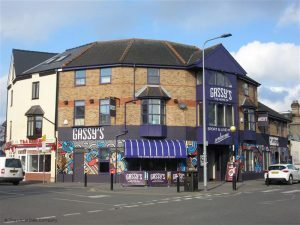 The pub is in an area of Cardiff popular with students so the final design was modern, graphic and picked up on the popular local music and sports scene. We often find our artists best work comes when they are given free reign of a space. With a clear brief and maybe a few ‘do’s’ and ‘don’ts,’ the result is organic and ultimately gives you the most site specific design you can achieve. If the artist can react and respond to elements around them, such as door frames, light switches, changes in wall texture; they can adapt their technique and style for the best results. We understand that embarking on such a large piece of artwork without a design however, is not least scary but sometimes impossible without client sign off. Therefore, we can create digital renders of the proposal before we get out our spray cans. Below is the initial design intent for Gassy’s, and the keen eyed among you will probably spot that key elements were moved so that they were not lost in door entrances. If you don’t have the space or the desire to cover a whole wall with Graffiti, you can still bring the playful and expressive side of the medium into individual works of art. 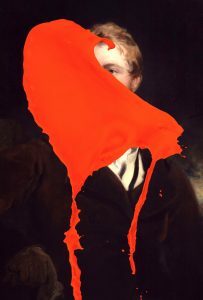 Again we would recommend that bold and punchy is best. The examples above are a lot of fun and instantly elevate them above your average framed artwork. A touch of paint gives the pieces an original and hand-made feel, and as both are quick to do, it isn’t going to blow the budget either!